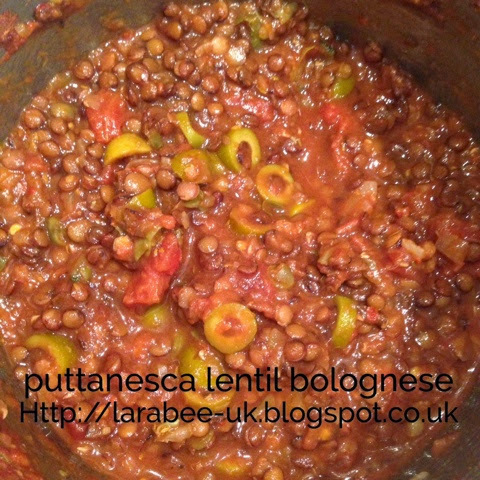 This dish doesn't look particularly appetising, I grant you, but it's blooming delicious and the great thing is that the lentils are really filling, so you don't need to serve as much pasta with it making it a bit healthier. I used green olives which adds quite a nice sharper distinctive taste but just stick to more traditional black if you prefer those. 1. Boil lentils for about 20 minutes. 2. In a large sauce pan gently fry the onion until translucent. 3. Place all ingredients into the saucepan, fill the chopped tomato tin with boiling water and add that too. 4. Bring to the boil and simmer for 20 minutes. Could also be cooked in a slow cooker. 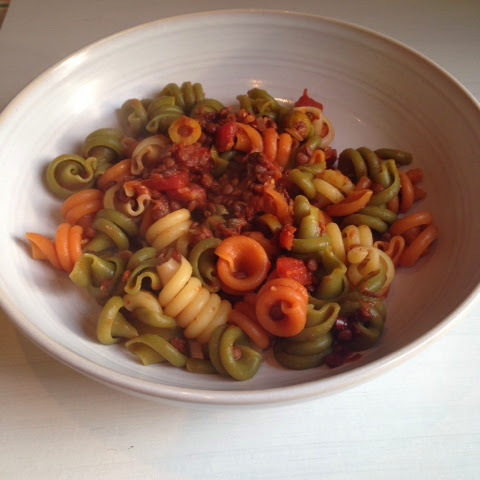 Meat eaters use 400g beef mince instead of lentils, fry until brown, then cook all ingredients for 20 minutes.